Step away from everything that is familiar to you like your job, friends and family. Then take yourself out of range of all the electronic noise from computers, mobile phones and the television. Now tell me this: When it is just you standing alone in the quiet of total solitude, who are you? A few weeks ago I asked myself this question and realised how attached I am to who I am trying to be. I have shared previously how I sometimes wish I was 'wonder woman,' the desire to be everything for everyone commonly arises. I want to be the best mum, partner, daughter, teacher, colleague … you name it. Why? Because I think that's what makes me me. This all came about when I had my car stripped of all it's stickers. 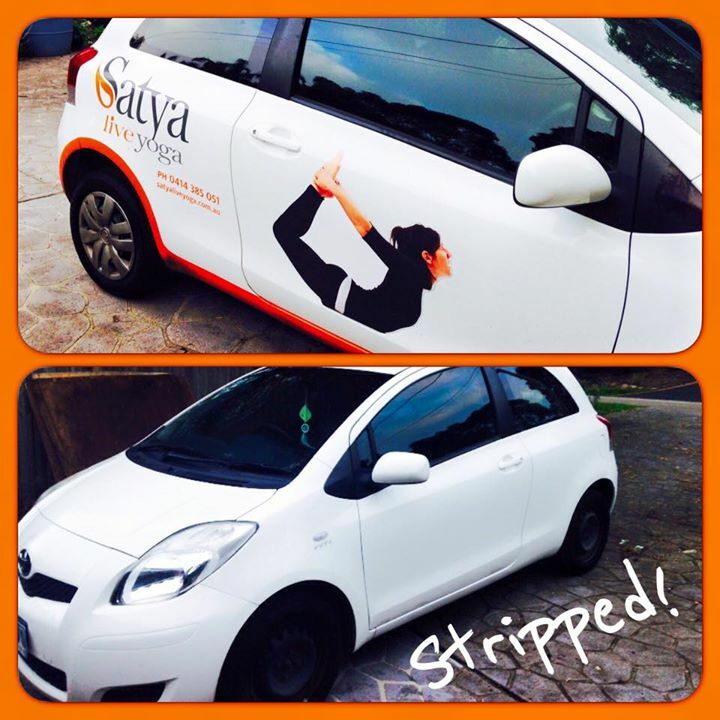 I had originally branded my car for advertising, establishing my business and to show the world that I am serious about teaching yoga. I had heard to many times that such and such had done a 4 week course and become a yoga teacher only to end up having to quit because it wasn't financially viable. So when I decided that I was going to give teaching yoga my all, I really wanted to give it my all and to be taken seriously. It was only when I removed the logos from my car that I realised how attached to them and my image, I had become. In a way, I had lost myself. The phrase “find myself” gets over 5 million searches per month in Google. That shows how common it is for people to feel disconnected from their true self and how interested they are in reestablishing that long lost connection. I know that I am not my car, I am not my business or the roles I play. Just as you too are not the work you do, the things you accomplish or the image you portray. It is yoga that reminds us of this. It is yoga that revels our deeply held values, passions, beliefs, and response patterns. It's through the continuous self-inquiry that one discovers the WHY behind thoughts and actions and through this process we shed the layers and peel back to the core of our Inner Self. For today, make at least 2 minutes to connect. I'm just asking 2 minutes out of the 1,440 minutes in the day. Close your eyes, notice your breath and soften into your being. As you are, nothing to do, no-one to please, no expectation to be met, nowhere else to be,nothing to fear, or achieve. Just be as you are. Prioritise this connection to you. Why? Because it is through knowing who we are that we settle into the deep contentment and fulfillment of being whole and complete.